"An incredibly simple summertime soup for all that extra zucchini from the garden. This soup is delicately spicy, full of flavor, yet low in fat and calories. Butter or oil can be omitted if using a non-stick pan. This is also a great soup to use for canning or freezing so you can enjoy the tastes of summer during the winter months!" Place a steamer insert into a saucepan and fill with water to just below the bottom of the steamer. Bring water to a boil. Add zucchini, cover, and steam until slightly tender, 5 to 6 minutes. Heat butter in a saucepan over medium heat; cook and stir onion in the melted butter until tender and translucent, 5 to 10 minutes. Mix grated ginger, cumin, coriander, mustard seeds, ground cinnamon, turmeric, cardamom, cayenne pepper, sea salt, and black pepper in a small bowl. Mix spice mixture into onions until coated. Mix zucchini into onion mixture; cook and stir until heated through, 2 to 3 minutes. Pour vegetable stock over zucchini mixture; stir well. Simmer until vegetables are tender, 8 to 10 minutes. Pour zucchini mixture into a blender no more than half full. Cover and hold lid down; pulse a few times before leaving on to blend. Puree in batches until smooth. 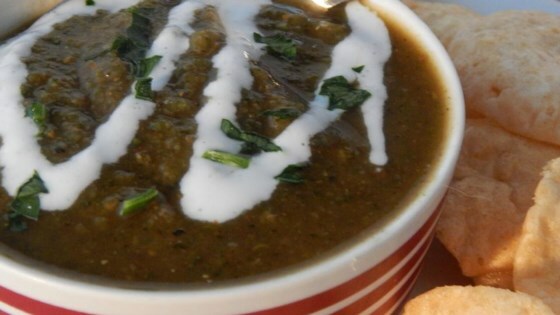 Pour soup into 4 serving bowls; garnish each bowl with 1 tablespoon cilantro and 1 cinnamon stick. Too spicy, cannot seem to fix with sour cream, yogurt or honey. Cut down on ginger. Too spicey and too thick. Next time I'll leave out the cayenne pepper and add more broth. SO Easy to make and very tasty. I love the way the spices combine in a mild yet surprisingly spicy way. Next time I will omit the cayenne as it was just too much for me.